If you have periodontal disease, our Kalamazoo dentist will recommend scaling and root planing. During a deep gum cleaning, our dentist will clean above and below the gum line to prevent further oral health issues. Keep reading to learn how our Kalamazoo dentist can help with root planing. Scaling and root planing is a deep gum cleaning procedure that patients sometimes need when their gum disease has progressed past the point of easy reversal. First, Dr. Schier will thoroughly clean your teeth and gum pockets, removing all plaque and bacteria that are contributing to your gum disease. It’s not uncommon for people with periodontitis to have receding gums. When gums pull back from the surface of your teeth, it exposes the roots. Periodontal disease can deteriorate gum and jawbone tissue until there’s nothing left to support your teeth. By scheduling a scaling and root planing, our gum disease dentist can stop this deterioration in its tracks. Once we clean the gum pockets, we’ll smooth out tooth roots to help encourage your gums to reattach to your teeth and to discourage the plaque from returning. Plaque and bacteria have a harder time adhering to a smooth surface, so this step should allow your gum pockets to heal and shrink. It’s important that you see Dr. Schier every 6 months (or more) for a teeth cleaning to protect your oral health. Often, people don’t realize they have gum disease until their oral health has deteriorated. While advanced gum disease is incurable, there are plenty of things our dentist can do to help protect your teeth, gums, and jawbone. Dr. Katherine Schier is dedicated to helping you maintain a beautiful healthy smile. 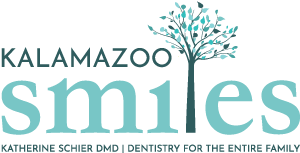 To schedule a scaling and root planing appointment with our Kalamazoo, MI dentist, call Kalamazoo Smiles today at (269) 353-3700.